We're really sorry for the inconvenience, but please would you disable your ad-blocker? Our adverts are relevant and non-intrusive, they appear only at the top and the sides, never in the content. They don't include auto-playing audio either, they really won't spoil your enjoyment of the site. Thank you in advance! Want to see this appeal go away forever? Support us on Patreon and we'll make that happen! Click the button on the left to find out more. "I'm not running an ad-blocker!" 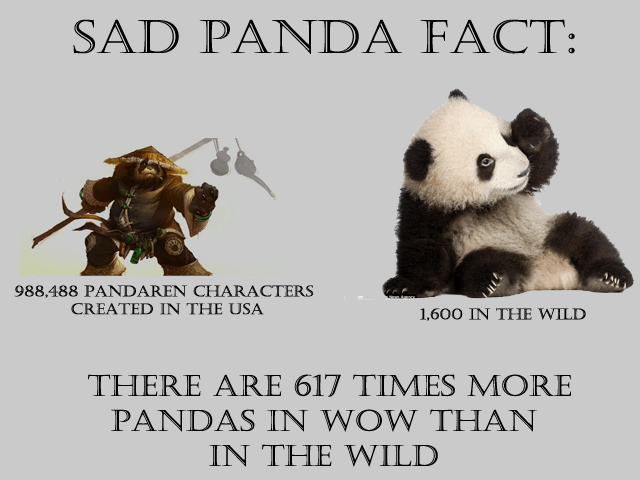 - Refresh/reload the page, if you still see the panda or have other problems then click here to contact us immediately, thanks. "But I never click ads!" - Doesn't matter, you should only click them if they interest you. We get paid based on the number of views AND the number of clicks. "You ruined the site!!!1! I want to send you hate mail!!" - Sure, click here. Another fact - We have the software and the power to completely block adblock users from our site, but we're not going to, at least for now. We figure most of you would like to support us and you only installed Adblock because of other sites that aren't so considerate with their ad placement. Please, don't punish us because of them, in the seven or so years I've been a blogger/webmaster I've ALWAYS considered the need to balance monetisation with reader experience. I want to build an audience not send them away. So go on, whitelist us and any other site you love. If it wasn't for ads, the internet would lose a whole chunk of really great niche content like this, which would be a real shame in our opinion. Kids these days eh? Actually no, let’s not do that again. Back in June we covered Lego Racers 2 and found that it worked pretty well on modern PCs. This time we’re taking a look at the first game. Just like the sequel, this game will let kids of any age race Lego karts around various themed circuits, out driving and out gunning the opposition. The game should install just fine on modern PCs. Simply put the disc into your PCs optical drive and follow the on-screen prompts. If the autorun program doesn’t start automatically, browse to the CD in Computer/This PC and run the “AR_KeyRun.exe” file manually. During installation, you will be asked if you want to install DX Media and DirectX 6. You should choose “No” to both of these choices, as the versions on the Lego Racers CD-ROM are certainly much older than the ones you already have on your PC. Lego Racers will run on modern versions of Windows only if you disable the introduction movie. Follow these step by step instructions to disable the movie. Windows 8 users:- If you are using a Start menu replacement, follow the Windows 7 instructions. Otherwise, open the Start screen and search for “Lego Racers”. Don’t click on the icon, instead, right click on it and choose “Open file location”. 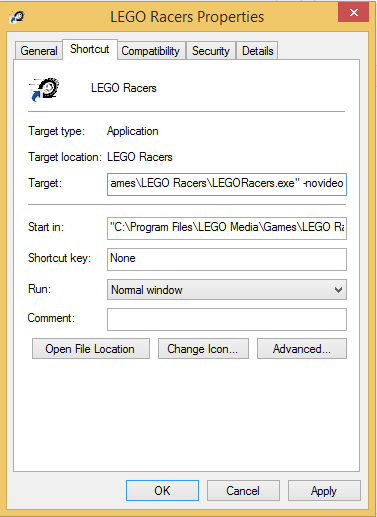 A File Explorer window will then open, right click on the Lego Racers icon and choose “Properties”. Now, follow the instructions under “Editing the shortcut”. 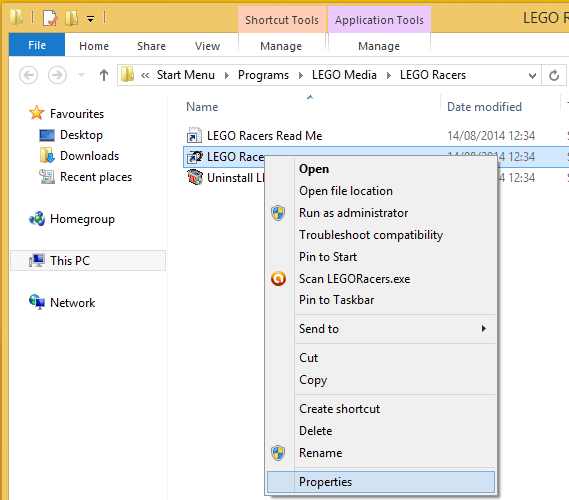 Windows 7 users:- Simply search for Lego Racers on your Start menu, then right click on the shortcut and choose “Properties”. Editing the shortcut:- The games shortcut properties should now be displayed. As you can see in the screenshot above, the user has already done this. You can click on “OK” now, but you might want to check out the next section as there are a couple more tweaks you can perform. Once you complete this tweak, you should always launch Lego Racers from this shortcut. If you have a desktop shortcut too you will need to update it in the same way. The games introduction video exists as an .avi file in the games installation directory. However, we couldn’t even play it using Windows Media Player. If you want to watch the intro, someone has kindly uploaded it to Youtube here. There aren’t any in-game options for tweaking visual quality in Lego Racers, but there is a way to force the game to run in higher resolutions. Using the technique above that you used to disable the intro video, edit the target box again and add the following two commands. Make sure there’s a space between “-novideo” and “-horzres”. This will run the game at 1280×1024 resolution. If you want to try a different resolution, simply substitute in the appropriate numbers. -horzres 1024 -vertres 768 for instance, would run the game in 1024×768 mode. 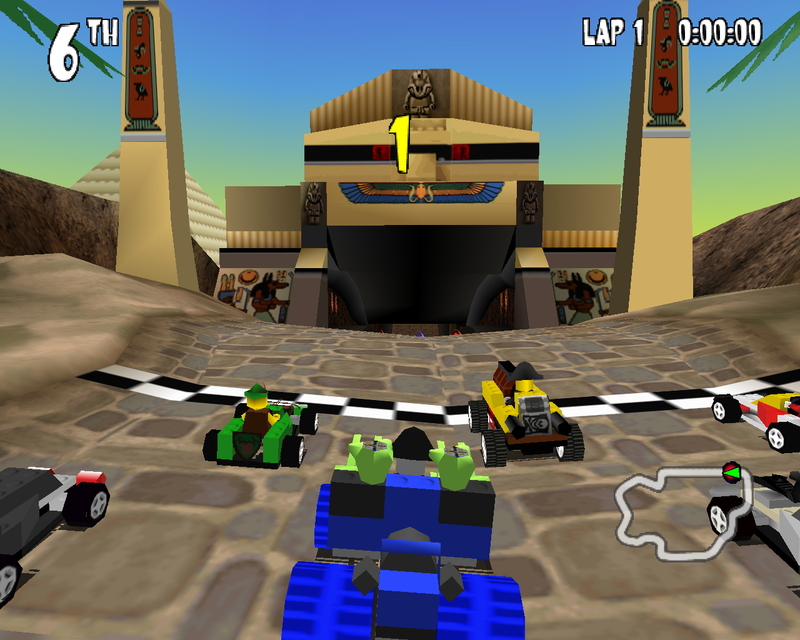 Lego Racers is a 4:3 aspect ratio (non-widescreen) game and may appear stretched if you force it into a widescreen screen mode. When running the game in a higher resolution, note that the menus and the Lego builder sections will not run full screen. Instead they will run in a box in the top left hand corner of the screen. The actual racing however will run in full screen and look significantly better thanks to the bump in resolution. 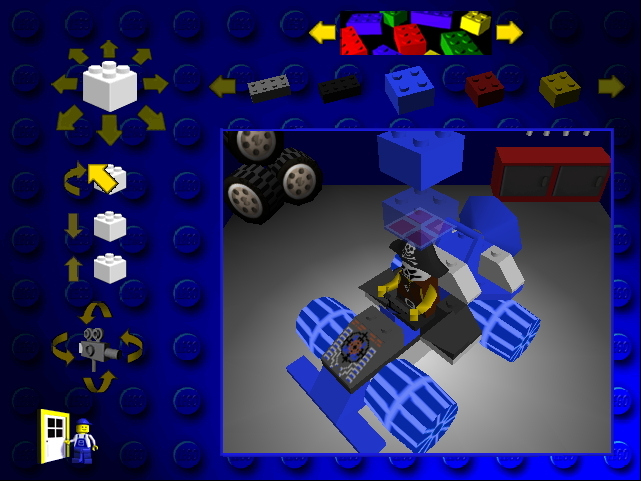 To configure controllers in Lego Racers, start the game and then choose Options. Now, choose either Player 1 controls or Player 2 controls depending on whose controller you want to configure. The game recognised our Xbox 360 controllers just fine, but wouldn’t allow us to assign accelerate and brake to the analogue triggers. Normally we can use Xpadder to remove this limitation, but Lego Racers doesn’t allow you to configure keyboard and gamepad controls that are active at the same time. Since Xpadder basically emulates keyboard presses, the only way to use it is to change the game into keyboard control mode. By doing this, you then lose the analogue steering. Better to just make do with using buttons for accelerate and brake. Problems saving games – Like many older games, Lego Racers places its save game files and various configuration files in the same directory that it is installed to. This can cause problems on more modern versions of Windows as programs are not normally permitted to write to the program files directory. 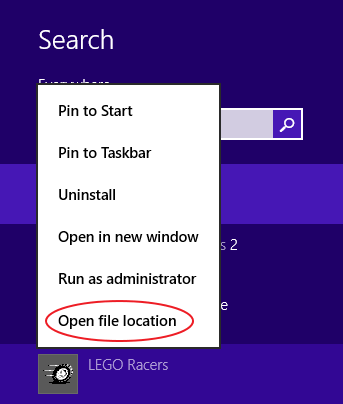 To avoid this problem, either install the game to an alternate location (e.g c:\Games\LegoRacers) or manually edit the permissions on the “LEGO Racers” folder. If you installed the game to the default location, the folder can be found under “C:\Program Files (x86)\LEGO Media\Games\LEGO Racers”. A tutorial on how to edit folder permissions can be found here. Save games data is stored in the “data” and “Save” directories in the Lego Racers folder. Remember to back these up periodically so that you don’t lose your save games. “Unable to set message drain” or “can’t open AVI” errors:- Check that you updated the games shortcut to disable the introduction movie as described in the Playing the game section above. If you can’t be bothered unlocking all the extras, you can download a 100% save file here. You can take a screenshot of your racing action at any time by pressing the “Print Screen” key. The screenshots are saved as bitmap (BMP) files in the games directory. Although you shouldn’t need them, there are some other options you can add to the shortcut too. Add any of the following in the same manner as you added the -novideo option. -window Runs the game in a window (didn’t work for us on Windows 8). -primary Force use of primary display device (most computers only have one anyway). Click on any screenshot to enlarge it. Any idea of to fix this ? You can’t. Check eBay for a copy. Followed the instructions but get the same message as ‘Tibo’ has??? any ideas on fixing that? Same problem as Tibo and Lachy, followed every prior Instructions, please help. Had the same message as Tibo, Lachy…when dont use the -horzres and -vertres, that error doesnt show anymore…but few seconds after the game starts, my computer restarts itself. Any clue, how to solve this? Try forcing VSYNC to ON in your graphics cards control panel. It’s very unusual for a game to physically restart your PC. The last time it happened to me was due to overheating. Yeah, it seems rly weird to me, never happened anything like this before…but I’m totally sure it couldnt be caused by anything else…all other programs working properly (even other games) and even if i switch off everything unnecesarry, after starting this game computer is restarted. Hi. Thanks for the help but i have a problem. The game is lagging on windows 8.1. I tried -select3d command and i have 2 options: Microsoft D3D RGB Emulation and D3D Hardware acceleration but i can’t select the other D3D Device. D3D Hardware acceleration is what you should choose. Are we talking constant low framerate or occasional stutter? Yes this is the problem. I Can’t select the Hardware only RGB. What happens when you try to select it? Huh? Can you rephrase that I don’t understand. When i try select the Hardware Acceleration always restore the RGB Emulation so i can’t play with Hardware Acceleration. The game works perfectly for me but I have one problem, when the menu opens, the option selector keeps scrolling downwards without me pressing any keys. Every menu in the game has the selector scrolling downwards infinitely, is there any way to fix this? Are you sure you don’t have a controller attached or something like that? I thought my dongle for wireless xbox 360 controllers was causing the problem, but even with it unplugged the game kept infinitely scrolling. Other games with controller support don’t give me this issue. The game still does not start up after I do any of these things? I have windows 7. What happens when you try to start it? Has anyone figured this out ? I’m on Windows 8, and when I try to run the “AR_KeyRun.exe” file it does nothing. I’ve tried changing the compatibility settings and everything, and it still doesn’t do anything. I’m having the same issue as Matt, but on Windows 10. I cant get any of the applications to run. 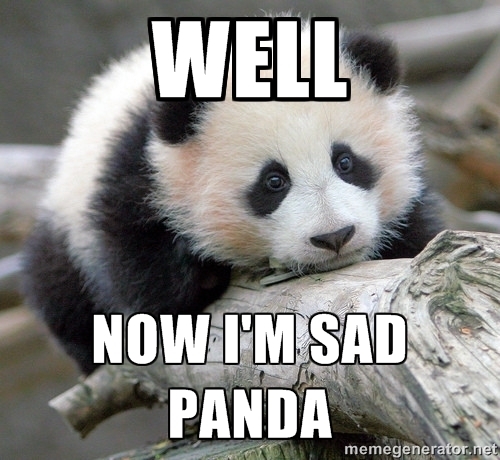 I’ve gone through compatibility mode, run as admin, etc… But not even the AR_KeyRun on the disc will run. I already have the program installed on my computer and running it directly from the file location, it does nothing. If I don’t have the disc in, a message will pop up telling me that it needs the disc to continue. With the disc, my computer hums for a few seconds but nothing else happens. Same here….did you find a solution? Me not.. I think you’re asking where to download the save game? I normally save the files to my computer, but in this instance I didn’t, sorry. Hi, I have installed the game and it works fine. But one issue… the text screen has like a black background. Even during the race the black overlap seems to disturb the enjoyment of the game. How to solve this issue? A few years late to the party, but here are the intro videos transcoded to mp4+mp3. Playing fine in Windows 10. Just replace the files currently in your installation folder!